This is one of my favorite locations ever. Nestled high up in Rock canyon with golden, rolling meadows, stunning mountain views, beautiful aspen groves, and it all overlooks the valley. We weren't totally sure how the meadow was going to look late October with most of the fall leaves gone, but it was INCREDIBLE. The warm neutral palette was perfect for a rustic, scenic location. 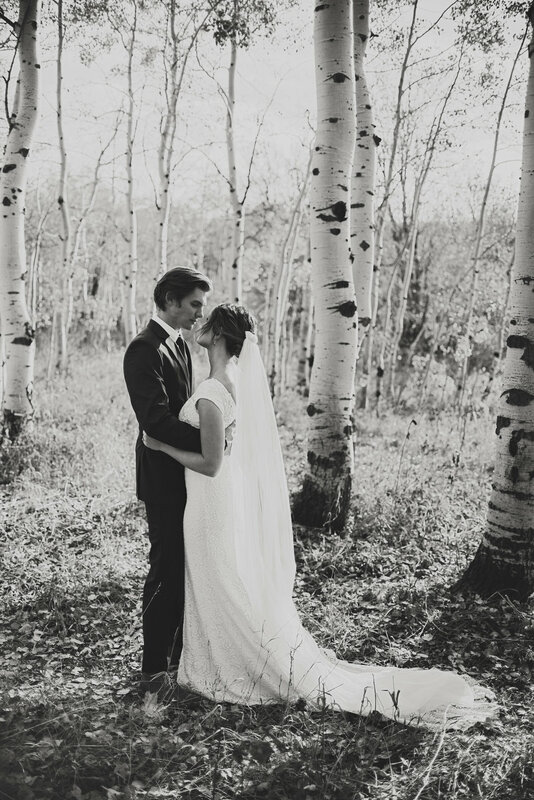 We started up in an aspen grove to film the first look, and it was completely a scene out of a movie. So heartfelt and romantic. We then traveled into the meadow and had the most beautiful light and views. I was in love with everything that Nikki was adorned with - her lace dress, cathedral veil, and classic fur shawl. Paul looked exceptional in his navy blue suit and his swooped hair. We had some fun with some pineapple, unicorn, T-Rex, and baseball hat props too! Scroll down to see them!